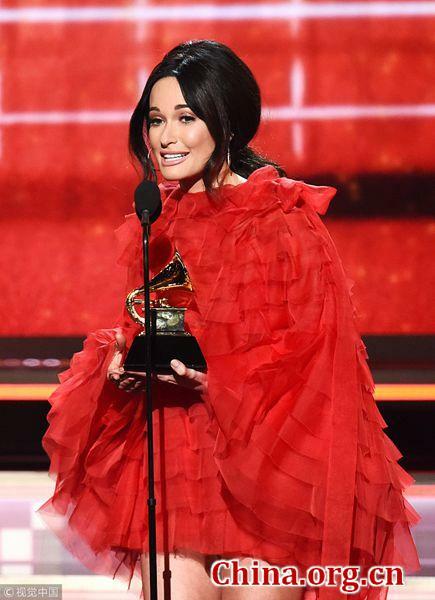 American singers Kacey Musgraves and Childish Gambino won big at the 2019 Grammys held in Los Angeles on Sunday, each taking home four trophies. Musgraves won Album of the Year and Best Country Album for "Golden Hour," Best Country Solo Performance for "Butterflies" and Best Country Song for "Space Cowboy." Led by singles "Butterflies" and "Space Cowboy," "Golden Hour" debuted at No. 4 on the Billboard 200 and No. 1 on Top Country Albums chart last year. "It was really important for me to bring my version of country music to a different group of people," she said at the ceremony. The Grammy winner was born in Golden, Texas. She released her major label solo debut album "Same Trailer Different Park" in 2013, for which she later won a Grammy for Best Country Album. Gambino's "This Is America" took four Grammys for Song of the Year, Record of the Year, Best Music Video and Best Rap/Sung Performance. Gambino, also known as Donald Glover, released the song and video for "This Is America" in May 2018. The song addresses the issues of gun violence as well as racism and discrimination against African Americans in the country. It debuted at number-one on the U.S. Billboard Hot 100, the music industry standard record chart for songs, published weekly by Billboard magazine. "This Is America" is the first hip-hop Song of the Year winner in Grammy history. Rapper Cardi B also has a breakout year by becoming the first solo woman to win best rap album for her debut "Invasion of Privacy." British pop singer Dua Lipa took home the award for Best New Artist. Lipa's musical career began at age 14. She released her self-titled debut in June 2017. The record includes Lipa's hit single "New Rules," which peaked at No. 6 on the Billboard Hot 100 chart. In February 2018, Lipa won two Brit Awards for British Female Solo Artist and British Breakthrough Act. In April, the single "One Kiss" by Lipa and Calvin Harris reached No. 1 on the UK Singles Chart. Lady Gaga and Bradley Cooper won the 2019 Grammy Award for Best Pop Duo/Group Performance on Sunday with their song "Shallow." From the original soundtrack of movie "A Star is Born," the song "Shallow" became a fan favorite. It showcases heartache, strength and courage. "Shallow" earned four nominations this year, including Song of the Year and Pop Duo/Group Performance. It won Best Song Written for Visual Media earlier Sunday. "I'm so proud to be a part of a movie that addresses mental health issues. They are so important. A lot of artists deal with that, and we have to take care of each other," Gaga said at the ceremony. 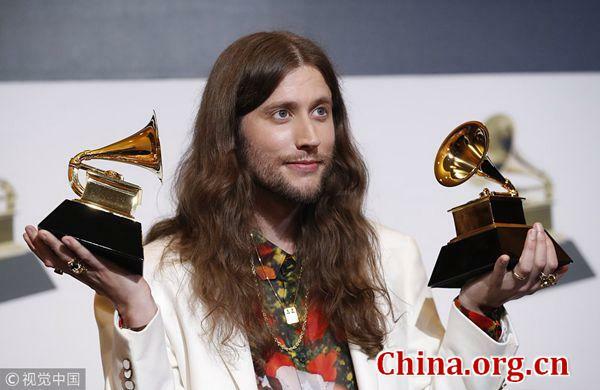 The annual Grammys is presented by the Recording Academy to recognize achievements in the U.S. music industry. The 61st annual ceremony took place at Staples Center Complex in Los Angeles. But Drake said artists shouldn't measure success by the awards they win, as he accepted the award for best rap song. "I want to take this opportunity while I'm up here to talk to all the kids watching, aspiring to do music. All my peers that make music from their heart, that do things pure and tell the truth, I wanna let you know, we play in an opinion-based sport, not a factual-based sport. It's not the NBA where at the end of the year, you're holding a trophy because you made the right decisions or won games."